Despite our best efforts to 'slip, slap and slop', most of us still manage to get an occasional sunburn. The summer sun can be strong, and even your horse is susceptible to sunburn. It's not uncommon to see horses with pink, peeling noses throughout the summer months. Sunburn over a horse's back can mean you'll have to wait to ride until the burn heals. You don't want to put a saddle on top of a painful burn. Most commonly, horses like grays or pintos with white or pink noses will become sunburned. The skin becomes pinker or red and the skin will blister and peel, just like yours does when you get a burn. Horses that are thin coated or have pink skin may become sunburned along their backs. Horses may also get sunburn along the protruding areas of the face, ear tips, and white areas on legs just as our noses, ears shoulders and collar bones get burned. While exposure to the sun during the hottest parts of the day may be enough to cause a sunburn on your horse, there are things that it can eat and things that we put on its skin that could also contribute to the problem. 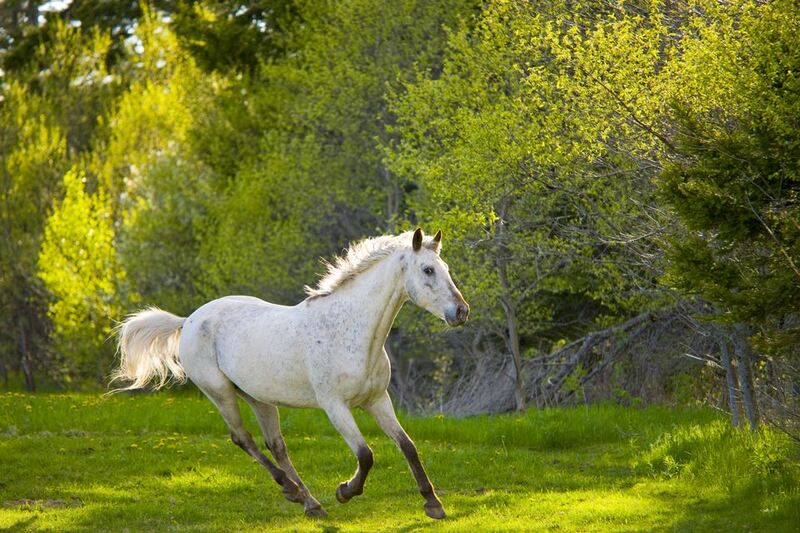 There are a number of plants that can cause photosensitivity in horses. St. John's Wort is one plant that can cause photosensitivity in both horses and cattle. I once badly burned my horse's nose by applying a herbal oil made with St. John's Wort flowers. The cure was definitely worse than the original problem. Alsike clover may cause photosensitivity as well as liver failure, gastric and neurological disorders. Dew Poisoning is the name given to the sunburn that occurs on the horse's nose and lower legs as is grazes through patches of wet alsike clover. Other plants that may cause photosensitivity are buckwheat, and ground elder (some gardeners may know it as snow-in-the-mountain). Sometimes grooming sprays or fly sprays may exacerbate a sunburn. Photosensitivity may also be caused by some drugs. Preventing sunburn most often means keeping them out of the sun when it's at its strongest. It's important to provide a shady place such as a line of trees or run-in shelter. Some people choose to keep their horses stabled during the day and turned out to pasture at night. This is a strategy used to prevent show horses from getting sun-bleached coats. Baby formula sunblock can be used to protect your horse's vulnerable areas. Because your horse will have it's head down to graze, the product will wipe off quickly so it will need to be reapplied frequently. Products made specifically for horses are brightly colored, so you can see when they've worn off. This might not be the best idea if you're heading to the show ring, however. Inexpensive zinc oxide paste is useful as both a sunblock and to help heal any previously irritated skin. I keep a tub of 'Ihle's Paste' on hand for sunblock and first aid. Fly sheets and masks can help prevent sunburn on your horse. A full mask such as the Absorbine Fly Shield covers your horse from the top of its nose to its ear tips. Pale colored fly/sun sheets give horses a little protection over their backs. Because these sheets are made with mesh, however, they shouldn't be considered total protection, as some sun rays will get through. Be sure that sheets fit well. A poorly fitting sheet can be irritating, especially over the shoulders and withers. Is Your Horse Lame in Front or Back?